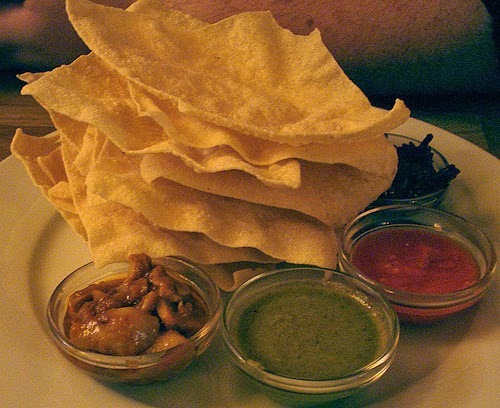 Papadam, also known as papad in Northern India, pappadum or poppadom in the UK is a thin, crisp Indian preparation sometimes described as a cracker. It is typically served as an accompaniment to a meal in India. It is also eaten as an appetizer or a snack and can be eaten with various toppings such as chopped onions, chutney or other dips and condiments. In some parts of India, it is served as an accompaniment to a meal. 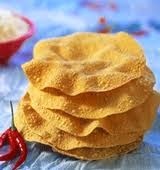 In certain parts of India, raw papadums (dried but unroasted) are used in curries and vegetable preparations. With the change of time, it is also used and served in Pakistan as an complimentary food or appetizer, but its origin is from India. 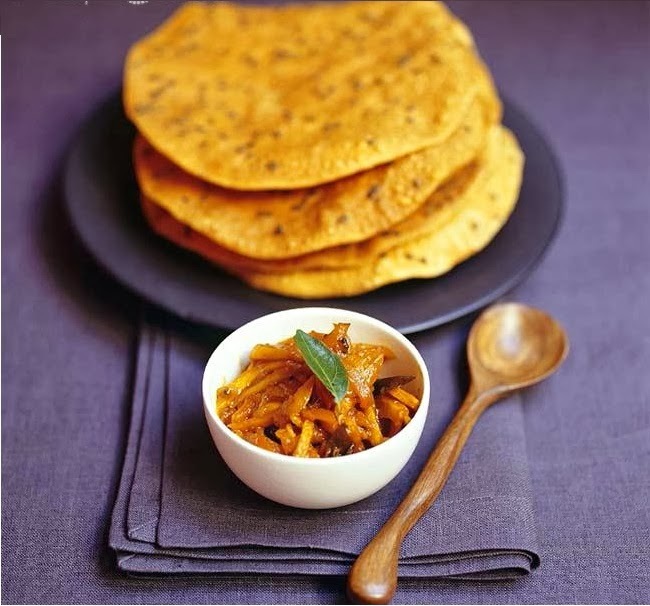 Papad can be prepared from different ingredients and methods. Arguably the most popular recipe uses urad dal or blackgram. Blackgram flour is mixed with black pepper, salt and then mixture is kneaded together. A well kneaded mixture is then flattened in thin rounds and kept for sun-drying. Once dried, papad can be stored for later consumption. Papad may also contain rice, sabudana, etc. as main ingredients. To achieve different tastes, cracked black pepper, red chilli powder, asafoetida, cumin seeds, or Sesame seeds are used as flavoring agents.